İzmir is a large metropolis in the west of Turkey and is the third most populous city (~4M) in Turkey. Izmir has a hot mediterranean dry-summer subtropical climate. One should expect 30-35 degrees Celcius temperature in September. Click here to find out more about İzmir. If you need local information please dial 0090 505 284 3106 or 0090 535 967 9996 (0 505 284 3106 or 0 535 967 9996 inside Turkey). Credit card phones are located at the terminals. A list of nearby cafes, stores, etc. Have trouble with the langauge? The following is a Turkish/English dictionary for what you might need upon arrival. "Where is the credit card paid telephones?" = "Kredi kartı ödemeli telefonlar nerede?" "May I use your phone?" = "Telefonunuzu kullanabilir miyim?" "Where is the Izban train station?" = "Izban tren istasyonu nerede?" "How much is this?" = "Bu ne kadar?" "Receipt please" = "Fatura istiyorum"
"I want to go to .... Hotel" = "... Oteli'ne gitmek istiyorum"
"I want to go to Yasar University" = "Yaşar Üniversitesi'ne gitmek istiyorum"
"I want to go to Yasar University Dormitory" = "Yaşar Üniversitesi Yurdu'na gitmek istiyorum"
"I want to go to the city center" = "Şehir merkezine gitmek istiyorum"
"I want to go to Forum Bornova Shopping Center" = "Forum Bornova Alışveriş Merkezi'ne gitmek istiyorum"
"City center" = "Şehir merkezi"
"Very good" = "Çok iyi"
"See you later" = "Görüşürüz"
You can top up your "İzmirim Kart" or purchase "3-5 bilet" from automated machines named "Yüklematik". Yüklematik has Turkish and English interfaces. Yüklematik accepts Turkish Liras only (5, 10, 20, 50 Lira banknotes and coins are accepted). What if your "Izmirim Kart" or "3-5 Bilet" are left without enough credits? You can simply ask other people to use their card for you and then you can give them the amount. This is quite common. 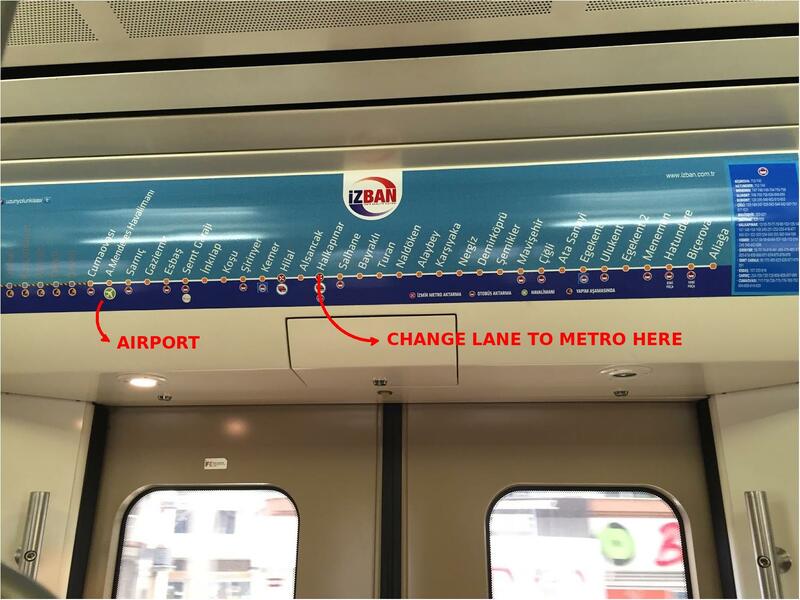 Halkapınar is the most convenient station to change lanes between Izban train and Izmir metro. The other option is Hilal Station but might be tricky to find your way! 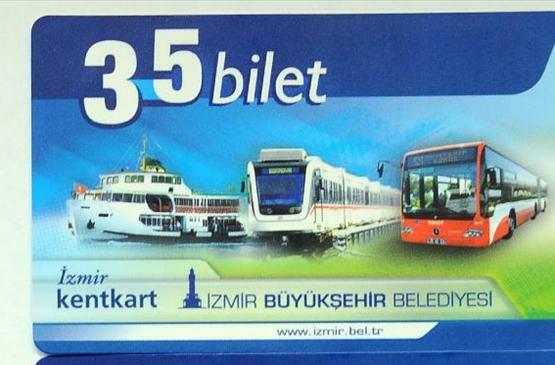 You can use "Izmirim Kart" or "3-5 Bilet" in Izban train, Izmir metro, busses, and ferries. You cannot use "Izmirim Kart" or "3-5 Bilet" in minibusses. These minibusses are turquoise in color. You are expected to pay the amount in cash to the driver. It is better to use other public transport options. Alsancak station is a cusp shaped station! The train will start moving backwards when exiting the station. Please click here for reservation form template. The total fee must be paid on arrival in cash. No towel, soup, shampoo, etc. is provided. Direct flights to İzmir: Please click here to find out a list of direct flights to İzmir Adnan Menderes Airport (ADB) (International). Flights connecting from İstanbul: Most flights to İzmir Adnan Menderes Airport (ADB) (Domestic) connects from İstanbul Atatürk Airport (IST) (Domestic). This means that you will need to transfer to the domestic terminals. As a remedy, the train station is closer to the Domestic terminals in İzmir. Train + Public Bus: Take the train named IZBAN from the airport to Aliağa direction. Leave at Halkapınar station. Walk to the bus stop area. Take the bus 12 or 253. Leave at "Dokuz Eylül Rektörlük" station. You will be able spot the hotel once you leave the bus. Havaş busses: There is a private bus company which operates to multiple destinations from the airport. Please click here to explore the available options. You should take the "Alsancak" Havaş bus. The bus will stop at "Büyük Efes Oteli (The Swiss Hotel)". İzmir Palace Hotel is 5 minutes walk away from the stop. Train: This is the easiest and the quickest option. Take the train named IZBAN from the airport to Aliağa direction. Leave at Alsancak station. You will be able spot the hotel once you leave the station. Train + Metro: This is the easiest and the quickest option. Take the train named IZBAN from the airport to Aliağa direction. Change the lane at Halkapınar station and take the Metro to Evka-3 direction. Leave at Bölge station. Public Bus + Taxi: Take the public bus 204 from the airport to Bornova direction. Leave at the last station. Take a taxi to Yaşar University. It's just 1km from the last stop. 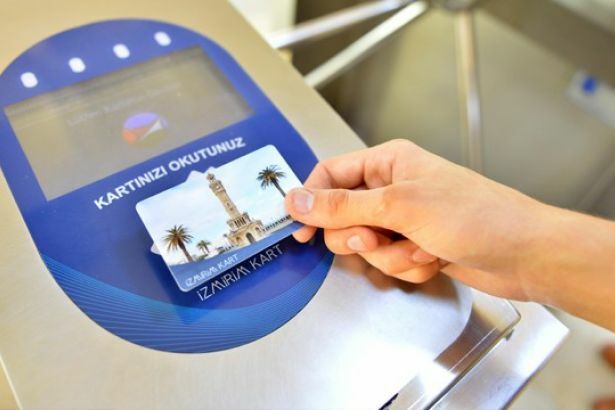 Public Bus + Metro: Take the public bus 204 from the airport to Bornova direction. Leave at the last station. Take the Metro from Bornova station to Fahrettin Altay direction. Leave at Bölge station. It's just 1 stop away from Bornova station. 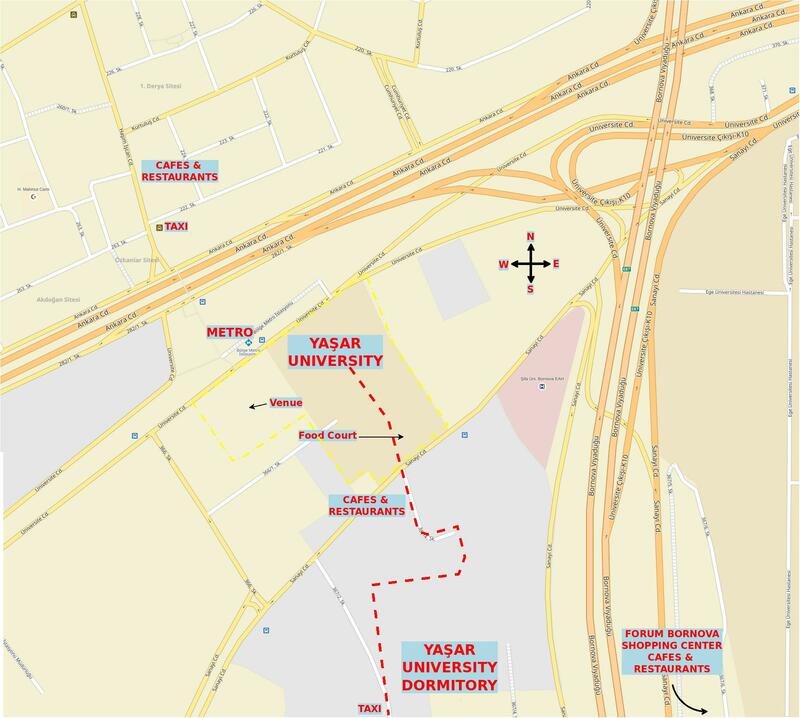 From Airport to Yaşar Dormitory: Follow the directions "From Airport to Yaşar". The domitory is in 10 minutes walk distance from the Bölge station. You can pass through the campus to shortcut. This is also better in finding helpful information. Please be warned that the surrounding of the dormitory is a new construction area. This area lacks street lights and pedestrian walks at some parts. Therefore using a taxi between the dormitory and university/metro would be ideal at night time. There is a taxi station very close to the dormitory. 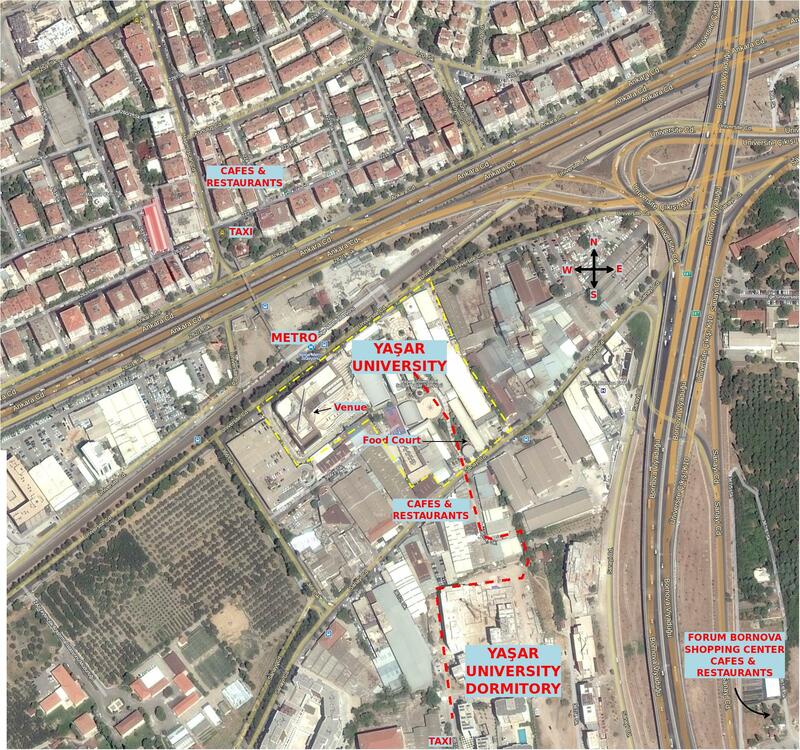 We also recommend using a taxi to go to Forum Bornova Shopping Center (2km from the dormitory). You can simply ask the receptionist to call a taxi for your. From Ibis Hotel to Yaşar: Take the IZBAN train towards Aliağa direction. Change the lane at Halkapınar station and take the Metro to Evka-3 direction. Leave at Bölge station. From İzmir Palace Hotel to Yaşar: There will be a shuttle bus. Alternatively, you can take the bus 12 or 253 towards Halkapınar direction. Leave the bus at the last stop. Take the Metro towards Evka-3 direction. Leave at Bölge station. Please click here to find information about the top attractions in Izmir. Catch a metro from Bölge station towards Fahrettin Altay station. Leave at Konak station. Explore the area: Saat Kulesi (the Clock tower), Kemeraltı (shopping district), Kızlarağası Hanı (tourist shopping), Hisarönü (great food). Come back to the Konak station. This tour will take around 2-3 hours. More? take a taxi (4-5 km) from Konak to Asansör (a historic lift). Asansör will provide you a nice view of the city. There is a restaurant where you can eat & enjoy the İzmir breeze, Meltem. Come back to Konak. This will take around an hour. Yet more? Either take a ferry from Konak to Karşıyaka (more shopping & eating options, great view of the city center). Walk inland where you will find in 2 km the train station. This will take around an hour. Now, you can take the train to your hotel, to the campus, or to the airport. Or alternatively, you can go to the cable car in Balçova. You can take bus 169 to go to the cable car and back. ECC 2016 will be held at Yaşar University, Block-Y, Room-010 (Airconditioned, 266 seats). We refer to the following web page. If you would like to extend your stay in Turkey to a summer holiday, we can recommend a number of locations. A short list is as follows: Antalya, Ayvalık, Bodrum, Çeşme, Foça, Fethiye, İstanbul, Kaş, Kuşadası, Muğla-Dalyan, Pamukkale, and Ürgüp/Göreme.